Establishing a unique logo is the most important part of your business because it distinguishes your company from the rest. A logo represents a company’s identity and at the same time makes the company memorable and recognizable. How do business owners create an effective and powerful logo? 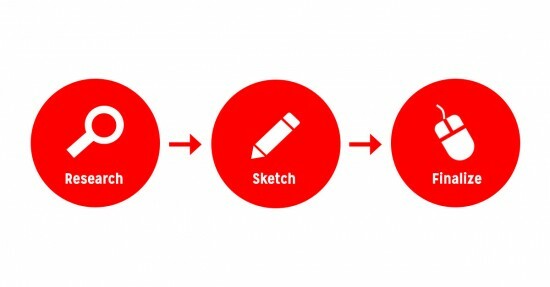 Keep reading to find out Ready Artwork’s six steps and tips we use for our logo design process. Before we begin the logo design process, Ready Artwork gives our clients a questionnaire to fill out so we can better understand their brand, image and position. Some questions you should ask first are what does your company offer and what type of products/services do you sell? Next, Ready Artwork will gather different logos from web or magazine inspirations that are relevant to our client’s business. Using the company’s name, we start to incorporate different types of font faces. The type of font Ready Artwork chooses depends on the demographics that clients are targeting. For example, if a client’s company caters to young women, we would select a slender and delicate or curvy and bubbly font. The client will select their favorite choices from our research and font study, which will give us an idea of which direction they would like their logo to move forward in. Afterwards, Ready Artwork creates hand drawings and quick sketches that symbolize and identifies the client’s company in a compelling way. The client will select two to three of their favorite hand sketches and Ready Artwork will begin to illustrate and fine-tune the logos to its full potential. At this step, your logo is almost ready. The client will have picked the final logo. Ready Artwork will utilize different color schemes that will further complement and accentuate the logo. Choosing colors is very impactful for a company because when consumers see the logo, it will help set the mood of how they feel about the brand. Once we’ve finalized the logo, Ready Artwork will package and deliver high quality files that the client can use in any circumstance. These files include vector graphics, jpg files, high and low resolution files, etc. We hope this logo design process has helped you understand how Ready Artwork works with business clients to achieve their branding goals. Remember that without a logo, companies would have a hard time standing out from their competitors. A compelling and memorable logo will help boost your company’s character. Call us at 626.400.4511 or contact us to get started on getting a new logo for your business today!